UD Cobal Capsule contains Mecobalamin, Vitamin B1 (Thiamine), and Vitamin B6 (Pyridoxine). Mecobalamin is the neurologically active, most bioavailable and best utilized form of vitamin B12, which is used for treating pernicious anemia (B12 deficiency). Mecobalamin is better retained by the liver and other tissues. It is required by the body to make healthy red blood and nerve cells. It also contributes towards improved memory, higher concentration, and sharper metal energy. Vitamin B1 (Thiamine) is a antioxidant properties, scavenges free radicals. They are also essential for growth, muscle development and nervous system strengthening. It helps in overall well being and increases appetite. 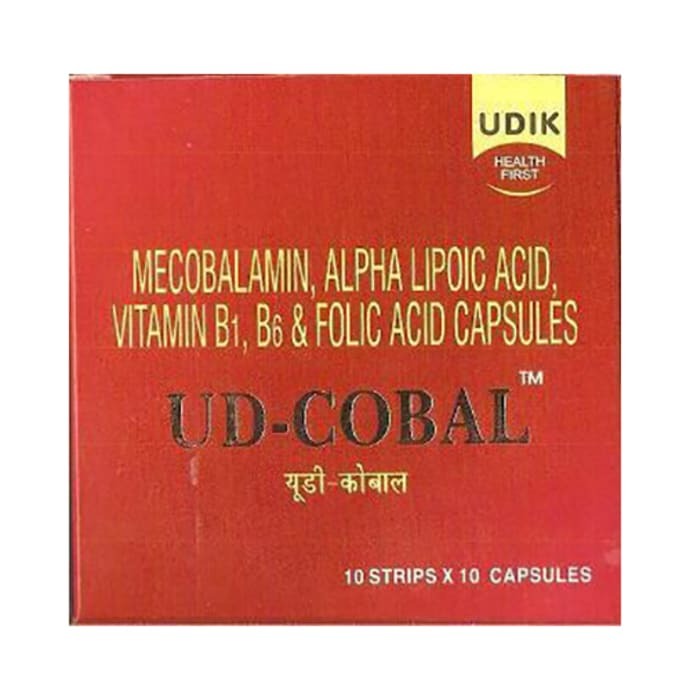 UD Cobal Capsule is ideal combination in Pregnancy & Lactation, Neurological Disorders and in Pre-Post natal weakness.